I recently had the op portunity to see Mt. Rainier. I had heard about its massiveness, but you never fully appreciate something until you experience it for yourself. This is one BIG mountain! Without getting too cliche, what mountain are you facing today? Is it one created by your fears or truly an obstacle to a happier life? Knowing the difference is crucial to your mental and emotional states. But in the end, all that matters is you made the climb. 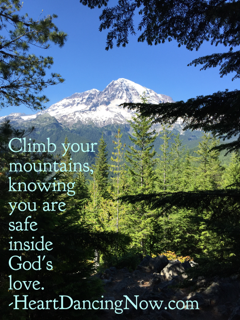 No matter what happens on your climb, you are safe inside God’s love.